Robert E. Lee : a biography · One Book. One Author. One Hour. Notes on front endpaper: "Lee Horse" Harry Lee six children. Mary-always sick. Rooney-Howard. Custis-in service. Lee's beliefs p. 189. He was shy. Mary was an only child. Custis-died Oct 1857. Arlington/White House/Romancock. 5000 acres plus 150 slaves. Lee's Amnesty oath-after the war. Mary Chestnut. Slavery p. 173. John Brown's raid. Underlinings/Notes: Underlinings: Lamb underlines information on Lee's family, early life/background, personality, physical characteristics, political views, work ethic, education, attitude toward slavery and love of Union. Notes: "Sui generis ," "7 children," "More jail," "Lee to Barbados," "Mar 25, 1818 Harry dies," "Ann Lee TB," "West P. 1929," "Jeff Davis, W.T. Sherman, Ed Allen Poe," "1st in class," "Feet 4.5 C, 5'11""July 26, 1829 Mother dies, 56 years old," "1803 Lee asked to marry Mary," "Mary Lee," "slaves," "profoundly conservative," "Mary 5 children," "Custis-16, May-13, Rooney-11, Anne-9, Agnes-7, Rob-5, Mildred-2, 1848," "cravat," "Mary ill, money overdrawn," "Rooney," "Courts martial, travelling," "Lee's philosophy," "children," "thoughts on slavery," "blacks, Comanches, Mexicans," "Oct 1857," "trip from S. Ant to Arlington-Oct 24 to Nov 11," "Lee took leave until Oct 59," "Oct 10, 1862 emancipation for slaves," "letter to Annie," "left army after 32 years," "Major General," "Lee beliefs," "amnesty pardons," "Lee summoned to Richmond," "letters to Mary," "Charlotte Lee dies," "1863 terrible year for Lee," "kisses," "no bitterness," "health problems," "Woodrow Wilson," "Savannah, Charleston, Norfolk," "Jeff Davis 81," "Jim White," "Valley Railroad," "I will give that sum," "marriage, race, children, army, college, Hero, tragic hero," "Oct 12, 1870." 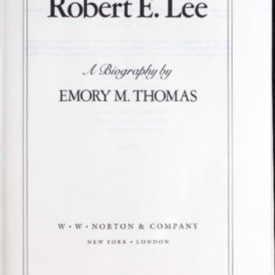 Thomas, Emory M, “Robert E. Lee : a biography,” One Book. One Author. One Hour., accessed April 19, 2019, http://booknotes.gmu.edu/items/show/318. The life of Robert E. Lee is a story of triumph - triumph in clearing his family name, triumph in marrying properly, triumph over the mighty Mississippi in his work as an engineer, and triumph over all other military men to become the towering figure who commanded the Confederate army in the American Civil War. But late in life Lee wrote what may be his most revealing phrase. He confessed that he "was always wanting something." This from perhaps the South's greatest hero, the man whose demeanor and presence in war were sufficient to inspire thousands to march to near-certain death. In this probing and personal biography, Emory Thomas's thorough examination of Lee's life reveals more than the man did himself, allowing us to find meaning in Lee's successes and failures. From his struggles as a youth with his father's humiliation, to his frustrating marriage into a proper and prominent family, and his lively relationships with young female friends and relatives, Lee - the uncertain scion, skilled engineer, consummate warrior, and college president - was actually an enigmatic person of latent passions. He lived in limbo between the self-control to which he aspired and the freedom for which he longed. "Lee, Robert E. (Robert Edward), 1807-1870." "Confederate States of America. Army--Biography."